How to Pick a Stock is written for the contrarian investor who wants an investing method that is based on cash flow facts, not on media hype and speculative impulse. 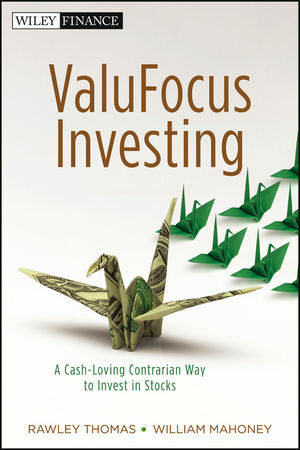 This book combines an accessible presentation of a contrarian investment model and the ValuFocus tool that offers a highly studious, detailed explanation of understanding a company's true intrinsic value. If you can calculate a company's intrinsic value on the basis of knowing if the market is currently under, fairly, or over pricing its stock, then it is possible to invest wisely in the stock market. Investors who want to buy undervalued stocks, or sell (short) overvalued ones will find this book immensely useful. The ValuFocus investing tool calculates the intrinsic value of every company in their database automatically. Thus, an individual investor can become an "A" student of a modeling process, or can go right ahead in using this tool to pick stocks and manage their own portfolio. Additionally, this book helps to develop an enhanced framework to fundamental equity valuation. Offering encouragement to individual investors by outlining a model that delivers satisfying returns, How to Pick a Stock is especially useful for those who are patient and believe in longer-term investing horizons. Rawley Thomas is President of LifeCycle Returns, Inc. (LCRT). He served as assistant treasurer of SuperValu Stores, joined Callard, Madden in 1981, cofounded Holt Planning in 1985, and directed Value Management research for The Boston Consulting Group for eleven years. Thomas is past Vice President of Practitioner Services for the Financial Management Association International (FMA) and is Chairman of the FMA Practitioner Research Committee. Currently, he serves on the Northern Illinois Accountancy Board and chairs the Financial Management Association Practitioner Demand Driven Academic Research Initiative (FMA PDDARI) supported by the CFA Society of Chicago. WILLIAM MAHONEY is a veteran investor relations practitioner, journalist, and author. He spent twenty years as a communications and investor relations professional with companies such as Motorola, Scott Paper, and Esmark, and twenty-five years as an editor of investor relations and corporate governance publications, including Update, which is the official publication of the National Investor Relations Institute; Shareholder Value magazine; and the newsletter Valuation Issues. He has written a half-dozen books on investor relations and corporate governance. Mahoney began his career as a reporter for the Ft. Wayne News-Sentinel after graduating from Marquette University.